There have been notable and significant advances in elucidating the chemical ecology of the invasive Halyomorpha halys (Hemiptera: Pentatomidae), brown marmorated stink bug. This highly destructive and polyphagous pest is originally from Korea, China, and Japan, but was accidentally introduced into North America and Europe. Prior to its invasion into these regions, little was known about its chemical ecology. However, since then, researchers have identified and synthesized its aggregation pheromone, documented its synergism with the pheromone of another Asian stink bug, Plautia stali, developed monitoring traps of various designs, and lures with reliable attractants have become commercially available. Furthermore, plant volatiles have been shown to have attractive, neutral, and repellent effects on attraction and retention of H. halys, and H. halys-derived volatiles have been shown to play a role in recruiting natural enemies. 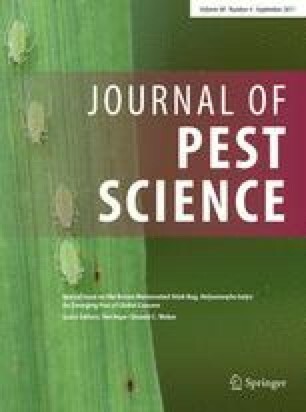 Finally, management strategies based on pheromone-based technology have been evaluated, including insecticide applications based on a cumulative threshold of adult captures in pheromone-baited traps, and the use of intensively baited trees in an attract-and-kill strategy to manage this pest. This review summarizes the available literature on the chemical ecology of H. halys and concludes with several research areas that should be explored in future research. We are grateful for the use of unpublished findings from several researchers, including Sean Boyle, University of Delaware; Tara Gariepy, Agriculture and AgriFood Canada, London, Ontario; Aimee Harper and Max Suckling of Plant and Food New Zealand; and Nik Wiman of Oregon State University. The comments of two anonymous reviewers were very helpful in improving the submitted manuscript. This project was funded, in part, by a USDA NIFA SCRI CAP Grant #2016-51181-25409. The use of trade names is for the purposes of providing scientific information only and does not constitute endorsement by the US Department of Agriculture. The USDA is an equal opportunity employer.